Western crosier of Archbishop Heinrich of Finstingen, 1260-1286. A crosier (crozier, pastoral staff, paterissa, pósokh) is the stylized staff of office (pastoral staff) carried by high-ranking Catholic, Eastern Orthodox, Anglican, and some Lutheran and Pentecostal prelates. The other typical insignia of most of these prelates, but not all, are the mitre, pectoral cross, and the episcopal ring. The crosier is the symbol of the governing office of the Bishop or Apostle. In Western Christianity, the crozier is shaped like a shepherd's crook. A bishop/head of church bears this staff as "shepherd of the flock of God", i.e., particularly the community under his canonical jurisdiction, but any bishop, whether or not assigned to a functional diocese, also uses a crosier when conferring sacraments and presiding at liturgies. The Roman Catholic Caeremoniale Episcoporum says that, as a sign of his pastoral function, a bishop uses a crosier within his territory, but any bishop celebrating the liturgy solemnly with the consent of the local bishop may also use it. It adds that, when several bishops join in a single celebration, only the one presiding uses a crosier. A bishop usually holds his crozier with his left hand, leaving his right hand free to bestow blessings. The Caeremoniale Episcoporum states that the bishop holds the crosier with the crook towards the people or forward. It also states that a bishop usually holds the crosier during a procession and when listening to the reading of the Gospel, giving a homily, accepting vows, solemn promises or a profession of faith, and when blessing persons, unless he must lay his hands on them. In Anglican tradition the crosier may be carried by someone else before the bishop in procession. When the bishop is not holding the crosier, it is put in the care of an altar server, known as the "crosier bearer", who may wear a shawl-like veil around his shoulders called a vimpa, so as to hold the crozier without touching it with his bare hands. Another altar server, likewise wearing a vimpa, holds the mitre, when the bishop is not wearing it. The crosier is conferred upon a bishop during his ordination to the episcopacy. It is also presented to an abbot at his blessing, an ancient custom symbolizing his shepherding of the monastic community. Although there is no provision in the liturgy of the blessing of an abbess for the presentation of a crosier, by long-standing custom an abbess may bear one when leading her community of nuns. The Church of God in Christ, Incorporated is the largest Pentecostal Christian church in the United States. The Church of God in Christ views its Presiding Bishop as the positional and functional leader of the Church. The Presiding Bishop bears a crosier. Eastern Orthodox tau-shaped crosier belonging to St. Dimitry of Rostov (Rostov museum). The Archbishop of Cyprus has the unique privilege of carrying a paterissa shaped like an imperial sceptre. This is one of the Three Privileges granted to the Orthodox Church of Cyprus by Emperor Zeno (the other two being to sign his name in cinnabar—i.e., ink coloured vermilion by the addition of the mineral cinnabar and to wear purple instead of black robes under his vestments). An Eastern archimandrite (high-ranking abbot), hegumen (abbot) or hegumenia (abbess) who leads a monastic community also bears a crosier. It is conferred by the bishop during the Divine Liturgy for the elevation of the candidate. When he is not vested for worship, a bishop, archimandrite or abbot uses a different type of staff in the form of a walking stick topped with a silver pommel. Croziers are often made of fine metal, or at least gilded or silver-plated. They may also be made of wood, though this is more common of the crosier carried by an abbot than of a bishop. Crosiers used by Western bishops have curved or hooked tops, similar in appearance to staves traditionally used by shepherds, hence they are also known as crooks. In some languages there is only one term, referring to this form, such as the German Krummstab, Dutch kromstaf. The crook itself (i.e., the curved top portion) may be formed as a simple shepherd's crook, terminating in a floral pattern, reminiscent of the Aaron's rod, or in a serpent's head. It may encircle a depiction of the bishop's coat of arms or the figure of a saint. In some very ornate crozeirs, the place where the staff meets the crook may be designed to represent a church. In previous times, a cloth of linen or richer material, called the Sudarium, was suspended from the crozier at the place where the bishop would grasp it. This was originally a practical application which prevented the bishop's hand from sweating and discolouring (or being discoloured by) the metal. Over time it became more elaborate and ceremonial in function. In heraldry, the sudarium is often still depicted when croziers occur on coats of arms. "In case an outside Bishop uses a Bishops' staff, this being either required by the function or permitted by the Ordinary, in what direction should he hold the upper part, or crook? The croziers carried by Eastern bishops, archimandrites, abbots and abbesses differs in design from the Western crozier. The Eastern crozier is shaped more like a crutch than a shepherd's staff. The sudarium (crozier mantle) is still used in the Eastern churches, where it is usually made of a rich fabric such as brocade or velvet, and is usually embroidered with a cross or other religious symbol, trimmed with galoon around the edges, and fringed at the bottom. The sudarium is normally a rectangular piece of fabric with a string sewn into the upper edge which is used to tie the sudarium to the crosier and which can be drawn together to form pleats. As the sudarium has grown more elaborate, bishops no longer hold it between their hand and the crosier, but place their hand under it as they grasp the crosier, so that it is visible. The traditional explanation for the form of Western crosiers, beyond the obvious reference to the bishop as a shepherd to his flock, is this: the pointed ferrule at the base symbolizes the obligation of the prelate to goad the spiritually lazy; the crook at the top, his obligation to draw back those who stray from the faith; and the staff itself his obligation to stand as a firm support for the faithful. It is considered to be both a rod and a staff (Psalm 23:4): a rod for punishing the recalcitrant, and a staff for leading the faithful. A crosier on the Coat of Arms of Basle, which was ruled by Prince-Bishops during the Middle Ages. The Eastern Orthodox and Eastern Rite Catholic crosier, is found in two common forms. One is tau-shaped, with curved arms, surmounted by a small cross. The other has a top comprising a pair of sculptured serpents or dragons curled back to face each other, with a small cross between them. The symbolism in the latter case is of the bronze serpent made by Moses in Numbers 21:8-9. It is also reminiscent of the caduceus or the rod of the ancient Greek god Asclepius whose worship was centered around the Aegean, including Asia Minor, indicating the role of the bishop as healer of spiritual diseases. Statue of Pope St. Sylvester carrying the older Papal Cross. A crosier was also carried on some occasions by the pope, beginning in the early days of the church. This practice was gradually phased out and had disappeared by the time of Innocent III's papacy in the thirteenth century. In the Middle Ages, popes would carry a three-barred cross (one more bar than on those carried before archbishops), in the same manner as other bishops carried a crosier. This was in turn phased out, but Paul VI introduced the modern papal pastoral staff, which instead of the triple cross depicts a modern rendition of the crucified Christ, whose arms are fixed to a crossbar that is curved somewhat in the manner of an Eastern crozier. John Paul I and John Paul II carried this same pastoral staff, as did Benedict XVI at the beginning of his papacy. 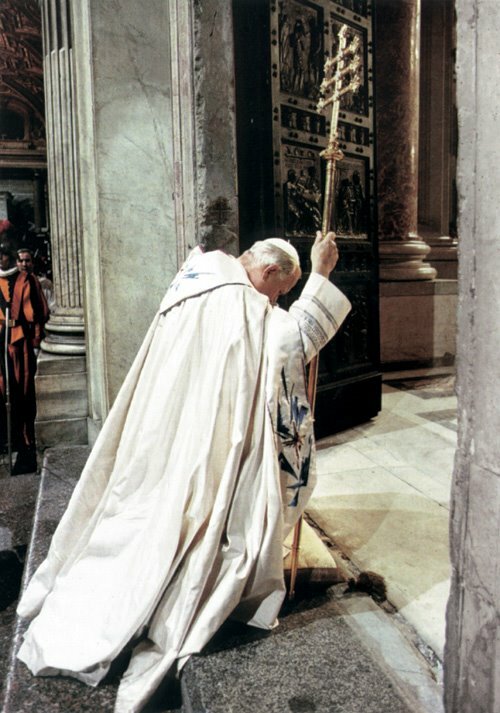 Since 2008, Benedict XVI has carried a more traditionally wrought staff or ferula. Crozier is also a relatively common surname of English and French origin. The meaning comes from a name for one who carried a cross or a bishop’s crook in ecclesiastical processions, from Middle English, Old French. "The Reichenau Crozier". Metalwork. Victoria and Albert Museum. http://www.vam.ac.uk/collections/metalwork/metalwork_stories/Reichenau_Crozier/index.html. Retrieved 2007-09-22. "Crosier". Catholic Encyclopedia. New York: Robert Appleton Company. 1913.
crosier — crosier. = crozier (см.). (Источник: «Англо русский толковый словарь генетических терминов». Арефьев В.А., Лисовенко Л.А., Москва: Изд во ВНИРО, 1995 г.) … Молекулярная биология и генетика. Толковый словарь. crosier — crosier. См. крючок [аскогенной гифы]. (Источник: «Англо русский толковый словарь генетических терминов». Арефьев В.А., Лисовенко Л.А., Москва: Изд во ВНИРО, 1995 г.) … Молекулярная биология и генетика. Толковый словарь.